I loved maps as a kid. During any of our trips or Sunday drives, I would have the map out in the backseat, looking ahead to the next town we’d be going through. I loved measuring the distance between towns and looking at all the names of towns. I remember having a huge atlas that was referenced time and time again to look up where family members lived or a place mentioned on the news. National Geographic is THE gold standard for reference books and this atlas is a must-have for your home or school library! 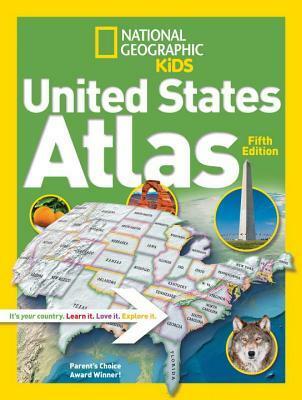 This atlas features over 75 maps and 350 images of all things USA. Cartographers have teamed up with experts in education to create this wonderful resource for learning all about our wonderful country. Children will learn not just about the location of each state but it’s physical and political features as well. There are icons to show each states economy and places of interest are mentioned highlighting the history and tourist attractions. The book is divided into Regions beginning with a physical map and a political map with borders. Then pages highlight the assets of that region before moving into individual maps and pages for each state. 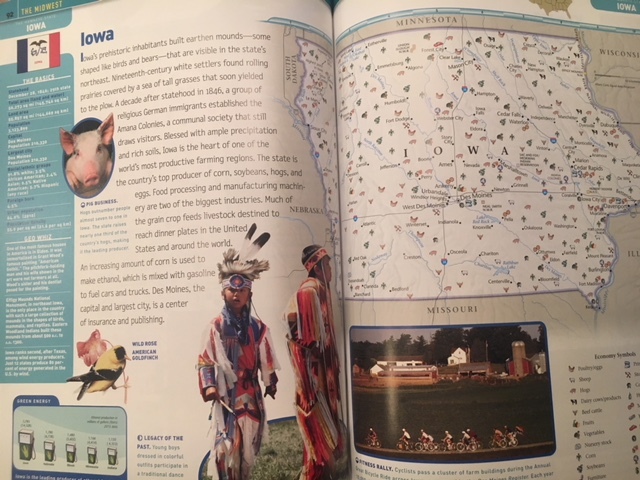 Of course, I had to feature the Iowa pages from the book. I love that it featured RAGBRAI (Register’s Annual Great Bike Ride Across Iowa) as well as the numerous farming productions that contribute to our nation’s economy. Kids will like looking at the maps up close and seeing what economies are key in a particular region. A corn stalk is featured right where we live and that is so true. We have a field right off of our backyard and are surrounded by corn and soybean fields everywhere we go. 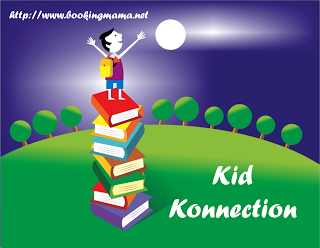 This is such a wonderful resource for classrooms, home libraries, and homeschooling families. National Geographic has knocked it out of the park again with a great book for children to learn and enjoy! I'm a big nerd so I love books like this and still flip through them at my age.